90. (1) Every person commits an offence who carries a weapon, a prohibited device or any prohibited ammunition concealed, unless the person is authorized under the Firearms Act to carry it concealed. (b) A registration certificate for the firearm. (2) Subject to subsection (4), every person commits an offence who possesses a prohibited weapon, a restricted weapon, a prohibited device, other than a replica firearm, or any prohibited ammunition, without being the holder of a licence under which the person may possess it. Weapons charges are serious offences and are dealt with harshly. The charges typically range from 1 to 10 years based on the seriousness of the offence. The charges against you and the legal process can be very overwhelming and confusing. You need to hire a lawyer who is experienced in criminal charges and has your best interest at heart. There are some cases that the accused can win their weapons case due to the evidence obtained by the police is thrown out or excluded due to the result of an illegal search or interrogation which lead to the discovery of the weapon. Someone with a minor record or a first time offender of weapons charges may be able to avoid jail time or a criminal record altogether with the right lawyer by their side. If you have been arrested or charged with a weapons offence, the smarted move you can make right now is to hire a lawyer who has extensive experience in this area and understands the your charges. It is strongly recommended that you find a lawyer that has experience in criminal and assault cases. Trust your future to Criminal Lawyers: Bruce Karten & Stephen Hebscher. 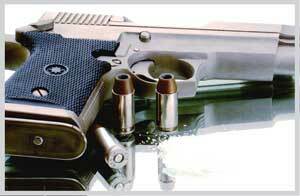 We have over 60+ years of experience and a 95% success rate in dealing with weapons charges in Toronto. Call us today for a free confidential consultation. R. v. L.C. ( 2012 ), North York Court – 65 year old man charged with assault with a weapon and possession of a weapon dangerous to the public as a result of a work-place dispute. Defense Counsel, was able to show that the alleged victim in this case, provoked the hostile interaction that led to the charges being laid and uncovered material that suggested this same individual had a history of prior, similar behaviour and had lied about the circumstances involved. The Prosecution withdrew all charges without the need of the allegations proceeding to trial.